Karl’s life-long passion for birds has guided the landscaping on his property in the foothills just outside Ashland, Oregon. In this talk, he will present the many ways a backyard can be made more attractive and useful for birds in our region. He will also introduce the feathered neighbors that now live on or have visited his backyard and who will be likely seen during the field trip. “With 117 species in just over three years, I feel especially grateful for the abundance of birds seen on our property two miles north of I-5 on N. Valley View Road. which consists of several habitats, including riparian, oak woodland, and grasslands. I’ve had quite a few days when I’ve traveled to see the birds and came home wondering why I didn’t just stay at home and see more species (of course, there are benefits to seeing new areas). However, when I get too old to tromp through the forests and swamps, there is comfort in knowing that I can sit on my deck and enjoy a multitude of birds. We are still in the process of planting and improving our yard habitat for the birds. Watching the hummers feed from our penstemons is one example of adding features for the birds, as well as feeders, water, and shelter. Adding features for specific birds can be rewarding when your target bird shows up. Across the road, Bald Eagles come in to feed on the afterbirth of the cows. This year I had Barn Owl, American Kestrel, Acorn Woodpecker, Red-tailed Hawk, Golden Eagle (about a mile away), Bullock’s Oriole, Brewer’s Blackbird, Western Kingbird, Oak Titmouse, Tree Swallow, Barn Swallow, California Towhee, and undoubtedly a number of others I didn’t know about, nesting on the property. This is a field trip to Karl’s property on the edge of Ashland—bring your binoculars! Lunch will be provided (included with registration fee) on Karl’s birdy patio where the birding adventure will continue. Fee for this Talk and Walk class is $50 ($40 for holders of the Conservation Science Stamp Set) with proceeds going directly to support KBO’s science and education programs. Contact Shannon Rio at shannonrio@aol.com or call 541-840-4655 to sign up. KBO’s Wings and Wine Gala is this Sunday. Please join us for a beautiful fall afternoon under the oak trees at Grizzly Peak Winery. More information about the event and buying tickets can be found on our WINGS AND WINE GALA WEBPAGE. KBO interns complete an orienteering seminar on Mt. 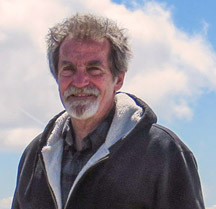 Ashland in 2012. As a Year of the Bird event, our 2018 Wings and Wine Gala celebrates the things we can all do to support bird conservation, every day. We will be feature our internship program by raising money this critical professional education. Over the past 20 years, Klamath Bird Observatory has hosted more than 250 volunteer student interns from all over the world. These inspiring bird conservationists have gone on to work with non-governmental organizations, government agencies, and academic institutions where they make significant contributions to bird conservation. Come to our Wings and Wine Gala and help us grow the next generation of bird conservationists. The Gala’s auction times are listed online and you can start you bidding now by CLICKING HERE. We look forward to seeing you this Sunday as we celebrate the Year of the Bird through education, storytelling, science, and conservation. The stunning photography and dramatic history of the Birding the Klamath Basin’s National Wildlife Refuges presentation will take us to some of the most amazing wildlife refuges—all within the Klamath Basin right here in our southern Oregon and northern California backyard. One of these, the Lower Klamath, was the nation’s first National Wildlife Refuge, established by President Teddy Roosevelt in 1908 specifically for protection of migratory birds. 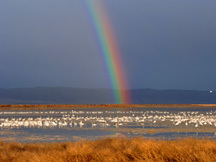 The Klamath Basin refuges are recognized far and wide for sweeping vistas and spectacular birding. This presentation is an invitation to visit the Refuges with public access and will include information on how to find them and what glory you might expect to see there. 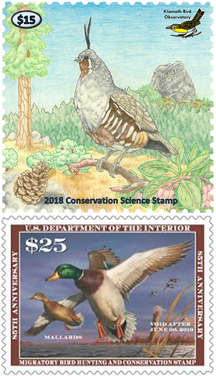 We will also discuss the Federal Duck Stamp’s role in protecting lands for wildlife and encourage the purchase of these stamps that support the Refuge. KBO Executive Director John Alexander will speak briefly on conservation, our wildlife refuges, and how we as individuals can make a difference on their behalf. This presentation is free. The Outdoor Store is located at 37 North 3rd Street in Ashland, Oregon. Shannon Rio is a wildlife educator who believes that when we connect with nature, we will naturally want to protect what we love: the birds and wild places. Klamath Bird Observatory advances bird and habitat conservation through science, education, and partnerships. Global Big Day – October 6! Global Big Day—the massively international collaborative birding event—is October 6! The Global Big Day held in May the last four years has been such a success, another worldwide eBird Big Day in October makes perfect sense! Why October? Because spring is rejuvenating the southern hemisphere and the northern reaches of the world are in the midst of migration. No matter where you are, we’re confident you can find some great birds on October 6. Let’s see what we can find together on the first October Big Day! Join eBird watchers all over the world for this single day of birding together. Information about participating in this eBird event and tips for finding more species are at the eBird Northwest website. CLICK HERE for more information and to join the eBird Global Big Day October 6. 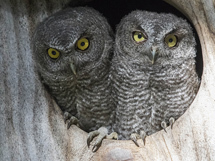 Great Gray Owl photographer Mel Clements will speak on his experience of photographing the Great Gray Owls of the Cascades. The presentation includes an introduction to the Great Gray Owl, its habitat, and the ethics of finding and photographing this magnificent, yet reclusive owl. His talk is accompanied by 43 of his photographs, a five minute dvd set to music, and small exhibit of framed photographs. We will leave early so that we can arrive in the Cascade Lakes area at sunrise. Pack a lunch and dress warmly. Morning temperatures are around 37 degrees. Participants will car pool. Don’t forget to bring your binoculars! More information about the field trip will be given out during the Friday evening presentation. Fee for this Talk and Walk class is $50 ($40 for holders of the Conservation Stamp Set) with proceeds going directly to support KBO’s science and education programs. 2018 is the Year of the Bird. To celebrate Ashland-based Klamath Bird Observatory’s Community Education Program is fostering a deeper love for birds and a better understanding of bird conservation and its importance. KBO’s Community Education Program is part of the World Migratory Bird Day education campaign. This year World Migratory Bird Day celebrates 2018 as the Year of the Bird. As such, KBO Education Programs are focusing on the actions we all can take to help birds, 365 days of the year. Every day is World Migratory Bird Day at KBO. KBO’s board president Shannon Rio has a passion for teaching about birds. Rio explains, “I have always loved birds, and the more I learn about them the more I understand that there is an urgent need to protect birds and their habitats.” Under Shannon’s leadership, Klamath Bird Observatory’s Community Education Program strives to teach people about birds. Shannon believes that the more we know about what we love the more we will be able protect what we love — birds. Rio has created KBO’s Talks and Walks. Talks and Walks offers a series of classroom lectures and follow-up field trips that teach community members about birds, science, and bird conservation. Talks and Walks focus on a variety of subjects including bird identification, photography, citizen science, and conservation success stories. One of the program’s recent themes focuses on the value of the United States Wildlife Refuge System. Over 100 years ago, the Refuge System was created to protect habitats that are critical to the survival of migratory birds during their entire annual cycles (that is, breeding, migration, and over-wintering periods). Many KBO Walks and Talks highlight the nearby Klamath Wildlife Refuge Complex, one of our country’s oldest and most important set of migratory bird refuges. To learn more about and participate in Klamath Bird Observatory’s Community Education Program, or to purchase a Conservation Stamp Set, visit www.KlamathBird.org. Also, on October 7th, KBO is holding their Wings and Wine Gala at Grizzly Peak Winery in Ashland, Oregon. Please join the KBO Community for this World Migratory Bird Day event and raise your voice for science-driven bird conservation. Klamath Bird Observatory advances bird and habitat conservation through science, education, and partnerships. We achieves bird conservation in the Pacific Northwest and throughout the migratory ranges of the birds of our region. We developed our award-winning conservation model in the ruggedly beautiful and wildlife-rich Klamath-Siskiyou Bioregion of southern Oregon and northern California. Emphasizing high caliber science and the role of birds as indicators of the health of the land, we specialize in cost-effective bird monitoring and research projects that improve natural resource management. Also, recognizing that conservation occurs across many fronts, we nurture a conservation ethic in our communities through our outreach and educational programs. 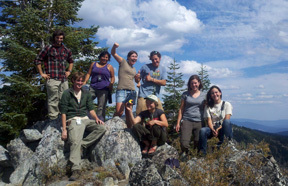 Visit Klamath Bird Observatory at www.KlamathBird.org. Word Migratory Bird Day (WMBD), formerly known as International Migratory Bird Day, is an educational campaign that is celebrating its 25th year in 2018. WMBD celebrates and brings attention to one of the most important and spectacular events in the Americas – bird migration. 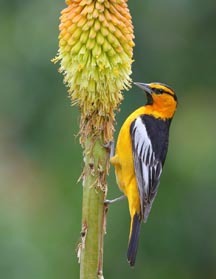 WMBD is coordinated by Environment for the Americas, a non-profit organization that strives to connect people to bird conservation. As a part of WMBD as many as 700 events and programs are hosted annually to introduce the public to migratory birds and ways to conserve them. Through WMBD the conservation community combines our voices into a global chorus to boost the urgent need for the conservation of migratory birds and their habitats. In 2018 World Migratory Bird Day celebrates Year of the Bird and the actions you can take to help birds, 365 days of the year. For more information about WMBD visit www.migratorybirdday.org. In 2018, we mark the centennial of the Migratory Bird Treaty Act, the most powerful and important bird-protection law ever passed. In honor of this milestone, more than 100 organizations and nature lovers around the world are joining forces to celebrate the “Year of the Bird” and commit to protecting birds today and for the next hundred years. 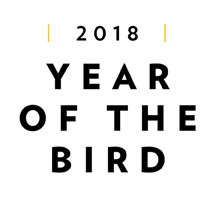 Year of the Bird is 12 months of storytelling, science, and conservation aimed at heightening public awareness of birds and the importance of protecting these critical species. Each month of Year of the Bird has a call to action — a simple but meaningful way individuals can help birds. By harnessing the collective passion and expertise of bird lovers around the world, we can champion causes for birds and inspire more people to work towards proven solutions. For more information about Year of the Bird visit www.nationalgeographic.org/projects/year-of-the-bird. It’s September in the Year of the Bird! Our Call to Action this September in the Year of the Bird is to do everything we can to help birds have a safe migration this fall. Each year, billions of birds migrate north in the spring and south in the fall. Along the way, though, they now face all sorts of human-made challenges. Whether it be from vast expanses of concrete to invisible windows and confusing artificial lights, the number of migrating birds that die every year is estimated to be as many as 1 billion. But it doesn’t have to be this way. Making windows bird-safe, turning off your lights, planting native plants, encouraging bird-friendly architecture in your community—these are all ways you can help birds have a safer migration. So for September, our Year of the Bird ask is to do everything you can to help birds have a safe migration this fall. You can read more about how to do this and how lights and windows pose dangers to migrating birds in the featured Year of the Bird post and KBO info handouts below. CLICK HERE to visit the National Audubon Society’s September’s Featured Action: Help Birds Have a Safe Migration post. And check out KBO’s info handouts: Reducing Bird Collisions with Windows, Birdify Your Yard, and Cats and Wildlife—available at our website (see link below). CLICK HERE to view KBO’s Reducing Bird Collisions with Windows info handout. CLICK HERE to view KBO’s Birdify Your Yard info handout. CLICK HERE to view KBO’s Cats and Wildlife info handout. 2018 is Year of the Bird! The National Geographic Society is celebrating the centenary of the Migratory Bird Treaty Act with a year-long celebration of birds. Dozens of Year of the Bird partners, including Klamath Bird Observatory, are coordinating Year of the Bird activities. Just a Few Spots Remaining for The Art of Bird Photography Class this Wednesday! Birding and photography have been Karl Schneck’s passions for over 50 years, so it’s a perfect combination for him to photograph birds. Not that long ago, it was difficult to get decent bird photos because many birds are small, move quickly, often in dim light, and difficult to approach. Modern digital photographic equipment has made the task much easier if the basic principles are understood. Along with reviewing different types of equipment for digital bird photography, Karl will go over techniques for getting the pictures and then post-processing them to improve them as your tastes dictate. His photography is about the birds and first requires the planning of the conditions, such as the light source and direction, wind, and background/foreground. The next step is setting the camera according to the environment and the desired outcome. And finally, the finishing touches with post-processing (Photoshop and others). The goal of the class is to present the options for bird photography and the ways to accomplish your requirements. Registration for this special class is $20.00 with proceeds going directly to support KBO’s science and education programs. Contact Shannon Rio at shannonrio@aol.com or call 541-840-4655 to sign up. As you know, Klamath Bird Observatory’s Wings and Wine Gala is back; join us on October 7th at Grizzly Peak Winery – CLICK HERE TO LEARN MORE ABOUT THE EVENT AND TO BUY TICKETS NOW. To increase broad participation in this important fundraising event, we are offering an online auction that is now open. This online auction gives all of our supporters an opportunity to bid on auction items. The online auction will feed directly into the live and silent auctions that will culminate during the Gala itself. This online auction is featuring items that include a trip to New Zealand, amazing artwork, tickets to the Rogue Valley Symphony, and so much more. CLICK HERE TO VISIT OUR ONLINE AUCTION. To participate create a login and begin bidding. Also, help us celebrate more than 20 years of KBO efforts to advancing bird and habitat conservation through science, education, and partnerships by coming the 2018 Wings and Wine Gala. Please help us continue our work by participating in this fundraiser. Tickets are available online – CLICK HERE TO GET YOUR TICKETS TODAY. For questions about KBO,the Wings and Wine Gala, and our auction please contact Jacob McNab at jmm@klamathbird.org or call 541-201-0866. Family visits a KBO banding station. Klamath Bird Observatory is offering public visits to our bird banding station near Fort Klamath in the Upper Klamath Lake area. The banding station is scheduled on Monday mornings through October 8. Individual, family, and group visits can be arranged by emailing KBO’s Banding Program Coordinator Bob Frey (see below). Situated along Sevenmile Creek within Fremont-Winema National Forest, this banding station has been operated each year during the nesting and fall migration seasons since 1997—one of the longest running bird monitoring sites in the region. In the fall, many songbird species migrate through the Klamath Basin and can be encountered here. The location is also a birding hotspot on the Klamath Basin Birding Trail. 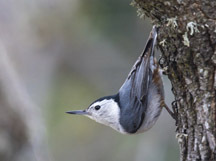 Also, KBO and Crater Lake National Park continue our bird ecology program series into the fall. These Ranger-led programs begin at the Park’s Steel Visitor Center and feature a visit to KBO’s banding station within Crater Lake National Park. The programs are scheduled on Thursday mornings—please check the Crater Lake National Park series flyer (see below) for upcoming dates and more details. Don’t miss these opportunities to visit KBO’s biologists in the field and see the birds they are studying up close! CLICK HERE to contact KBO’s Banding Program Coordinator Bob Frey to arrange a visit to KBO’s Sevenmile Creek banding station. 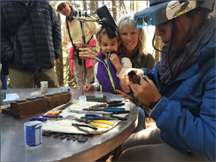 CLICK HERE to view the Crater Lake National Park bird banding visit flyer with more information and how to register. CLICK HERE to view the Klamath Basin Birding Trail website for birding hotspot descriptions, maps, and other local birding resources.